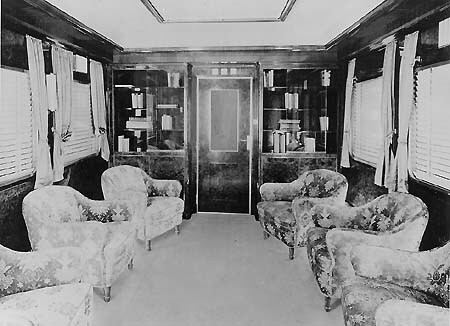 The P&O steamers from England to Melbourne and Sydney had their first stop at Albury, then at Fremantle on the Indian Ocean. A Cape gauge North Fremantle - Perth - Albury had been ready in 1889. In 1897 the WAGR reached Kalgoorly. The strategic value of a connection with the East through the deserted Nullarbor Plain was pointed out by Lord Kitchener. In 1917 it was achieved by the standard gauge Commonwealth Railways (CR) and the first Trans Australian connected Kalgoorlie with Port Augusta. 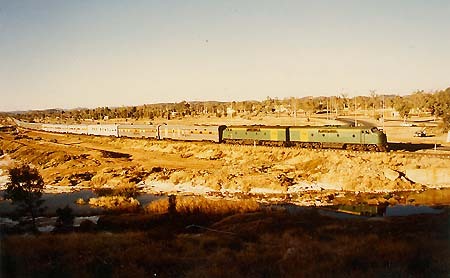 The trains consisted of 11 wooden cars, sleepers 1st class, 2nd class with 4-berth compartments, diner, lounge and two bulk mail vans, hauled by simple tenwheelers of class G, than C. By this way the Ocean travelers could save two days, but at Kalgoorlie they had to walk to the SAR Cape gauge tracks, in Terowie they changed to SAR’s broad gauge and at Adelaide they took the Overland. 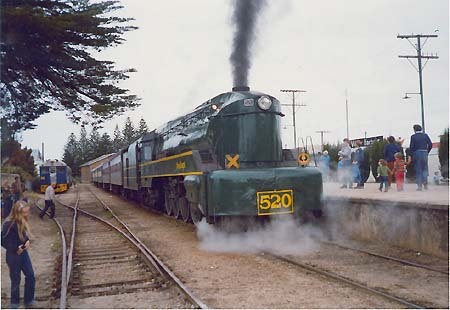 Only from 1937 broad gauge trains connected Port Augusta with Adelaide, then partially hauled by the “shark-nosed” 520 class Niagaras of 1943. A “Commonwealth” variant of that type was in consideration, but not built. In 1952 a true de-Luxe, built by Wegmann, Germany, replaced the old “Trans” with its piano in the wooden “Relaxation Car”. 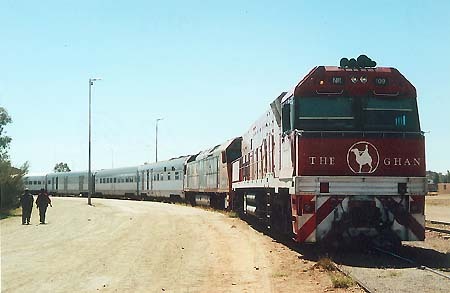 The Commonwealth Express, consisting of sleepers, diner, lounges and a round-end observation car, hauled by the nice maroon/silver colored Clyde-General Motors diesels, did run from Kalgoorlie to Port Augusta. From 1969 it ran from Perth to Port Pirie, now with stainless cars. In 1970 re-gauging of the NSWGR west of Broken Hill rendered possible the first true trans continental train - the Indian Pacific from East Perth to Sydney. On the NSWGR east of Lithgow it was hauled initially by two class 46 electrics and on the WAGR by pastel/light-blue General Motors type engines in “road switcher” look. Then Australian National (AN) avoided the many changes of locomotives. 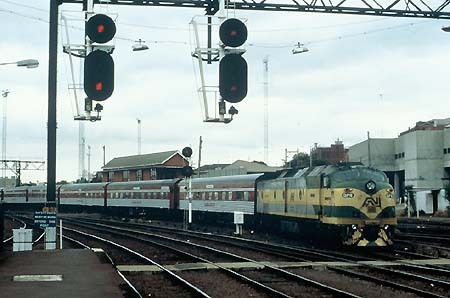 In 1987 the train became diverted via Adelaide and soon the old Trans-Australian was stopped. The Indian Pacific generally consisted of 15 cars and at least once, when two trains had to be combined, of 30 cars. 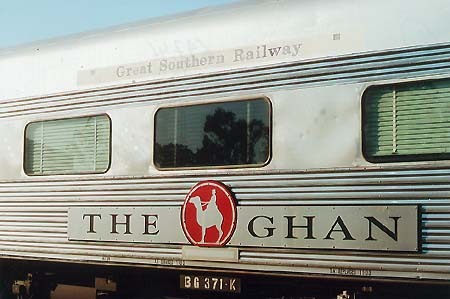 In 1998 the British firm Serco Asia Pacific changed the three trains “Overland”, “Indian Pacific” and “The Ghan” into a privatized tourist business. Car transporters Adelaide - Perth. 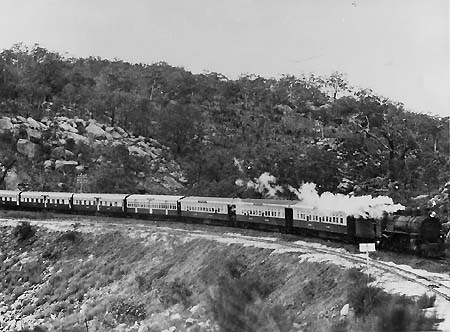 Later traction by one NR diesel Sydney - Perth. Colors: AN locomotives green/yellow, NR yellow/black, cars stainless. The other trans-continental line was to cross Australia in north-south direction and the threat by the Japanese in WWII proved its necessity. A first short line from Port Darwin southward had been built in 1888 as far as Pine Creek, then extended to Birdum. In the South SAR built a Cape gauge from Port Augusta northward to Marree in 1884, extended by the CR in 1929 to Alice Springs, a lonely place in the center of Australia. 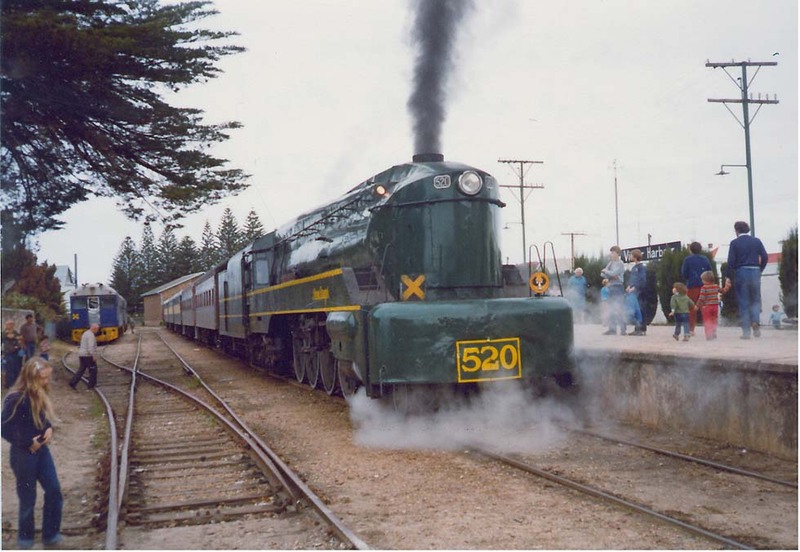 A typical train consisted of half a dozen wooden cars with open platforms, nicknamed "The Ghan", that means Afghan. In 1957 a new standard gauge reached Marree, where the passengers changed to the Cape gauge, from 1961 equipped with the maroon-colored Wegmann cars. 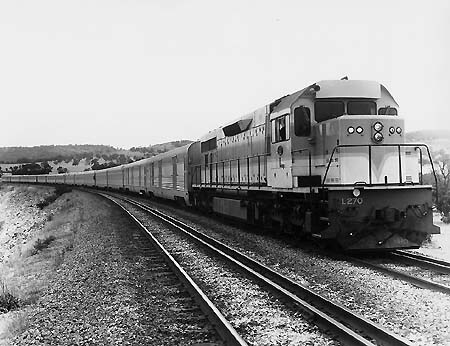 From 1980 a new standard gauge Ghan with stainless steel cars similar to the Indian Pacific connected Adelaide with Alice Springs. In 1984 a short-term "The Alice" came from Sydney. The losses of AN's long-distance trains Indian Pacific, Ghan and Overland however attained a billion Australian dollar per annum and in 1997 they were taken over by a new Great Southern Railway (GSR), using National Rail diesels. 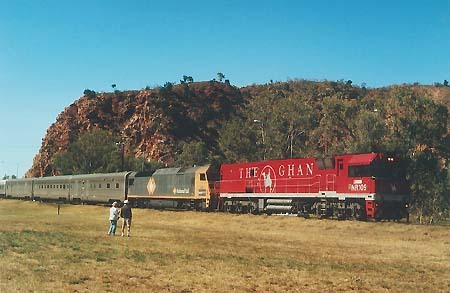 From 1998 the Ghan, now a GSR train, ran Sydney - Adelaide - Alice Springs, from 1999 alternating with a Ghan Melbourne - Adelaide - Alice Springs. 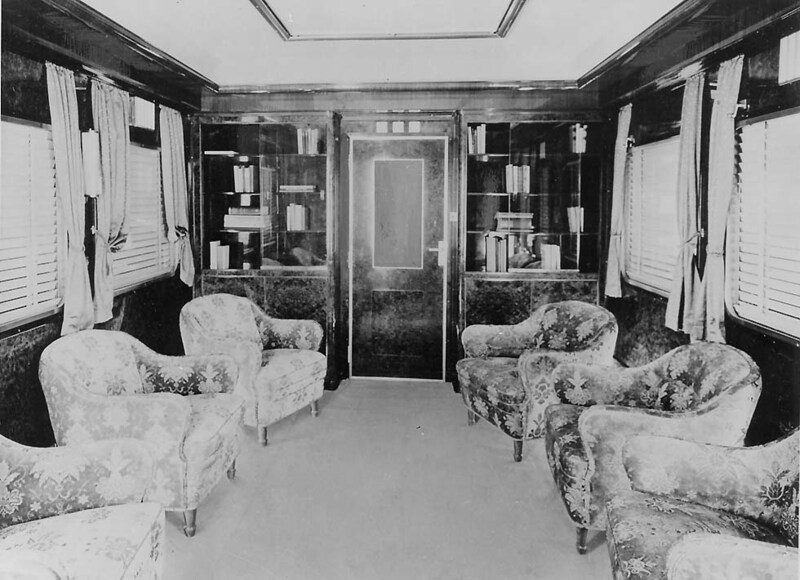 It consisted of up to 25 cars, the same types as the Indian Pacific. 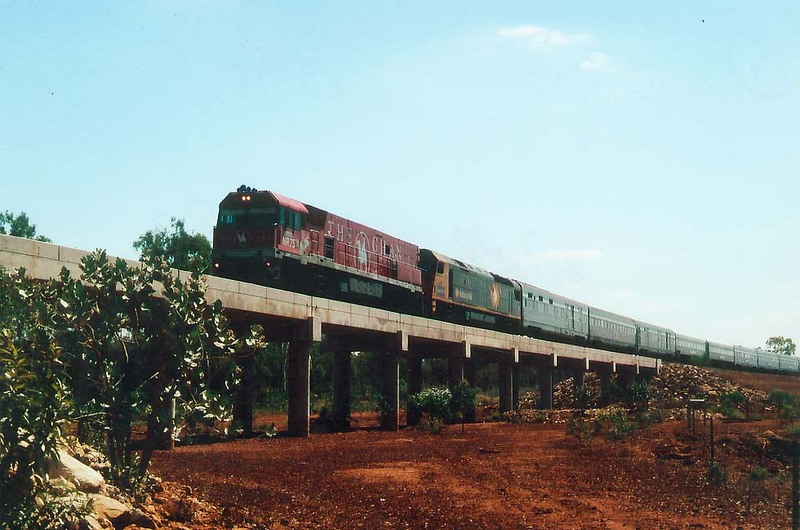 In 2004 finally the Ghan was extended to run from Adelaide to Darwin Berrimah with coach transfer to the city. On its first trip on February 1, it consisted of 43 cars, hauled by two red NR diesels. With a length of 850m and often 30 to 40 cars it became the heaviest passenger train of the world. The Ghan is an attraction for holiday travelers, TV and magazines and its impact on the tourist industry must not be underestimated. Compared to Amtrak, GSR fars are roughly twice as high. Even the idea of new railways emerged, mainly a connection with Queensland, and though they could be justified only by cargo traffic, passenger trains would not be excluded. And at Port Augusta appeared a fascinating nostalgic First Ghan with steam locomotive.